Today’s post is a bit of a cheat, as unfortunately I have a night where I can’t drink. Due to an incident involving a microwave and an ill-advised Ginster’s steak slice, I’ve burnt the roof of my mouth and am in quite a lot of pain. However, I am an obsessive tasting note writer, so it’s time to dig into my notebook and pull out something tasty from the past. 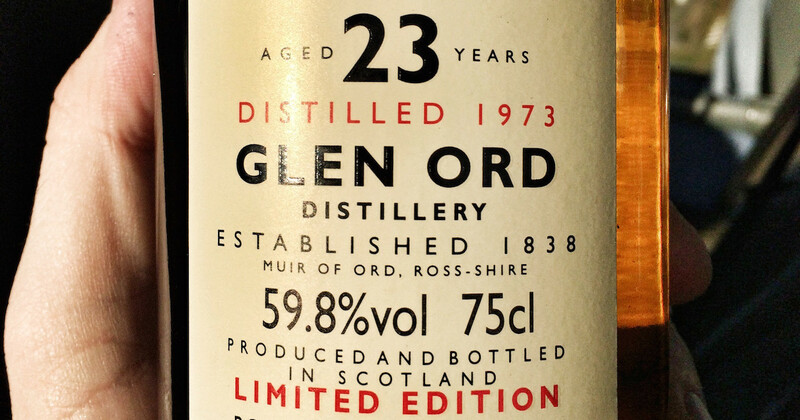 So, dram #22 is one I got to taste back in October, during a trip to Scotland and a visit to the distillery – Glen Ord 1973 Rare Malts. You don’t see much from Ord these days, thanks to Diageo rolling the output from the distillery into the Singleton range, along with whisky from Dufftown and Glendullan. Until recently, each distillery’s Singleton release was only available in a specific region – Dufftown in Europe, Glendullan in the USA and Ord in Asia – but the range is now going worldwide, in an effort to take on the likes of Glenlivet and Glenfiddich, the two biggest selling whisky brands. As such, Ord has been growing to meet the hoped-for future demand, with what amounts to a second distillery being built on site over the past few years. The whole lot sits next door to the Glen Ord maltings, which provide malted barley to many of Diageo’s distilleries, but in the past it had its own saladin boxes. Those buildings have now been repurposed, along with a bit of new building, and they now have an extra mashtun, twelve new washbacks and eight extra stills. With so many stills and washbacks, as well as them being divided across the two halves of the distillery – old and new – the moving of liquid around the distillery is logistically quite impressive. 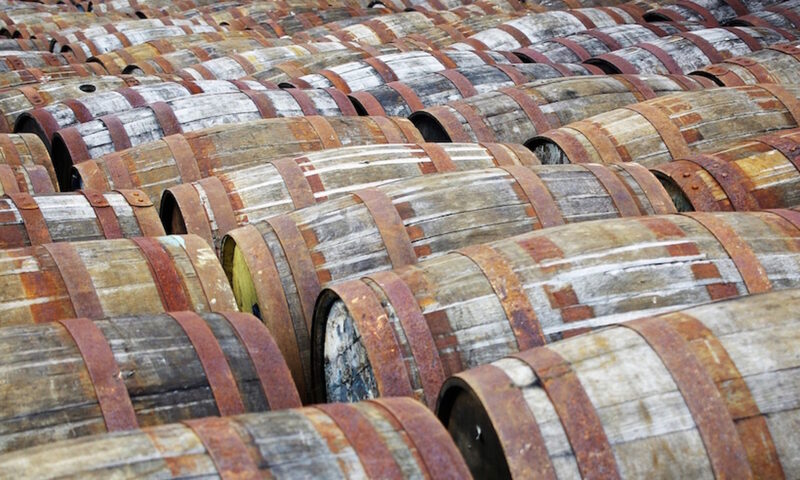 They have wash chargers, spirit receivers and extensive piping connecting all of the pieces of the distillery, allowing them to pump wash and spirit to wherever they are needed, and they combine the output from both stillhouses before tankering it away to be filled into casks. However, today’s dram is from the olden dayes, before it turned into the giant producer it is today. I’m still a fan of their spirit, and Glen Ord is my favourite of the Singleton gang (I even wrote about the 12 Year Old in 1001 Whiskies You Must Try Before You Die), but the older bottlings are definitely the ones I want to try the most. The Rare Malts 1973 is the oldest vintage Ord I’ve tried yet, and one I’ve been after for a while. Nose: Iced gems, pear drops, honeysuckle and citrus touches – warm orange and lemon peel. There’s a bit of earthy funkiness, but it’s swamped by sweetness – marshmallow and sweetened whipped cream. Palate: Lots of sweetness, with lemony butter icing, royal icing and sugary (solid) meringues. Perfumed oak and sandalwood pop up behind that, along with apples sprinkled with icing sugar and sharp oak. A drop of water softens out the oak, bringing out vanilla and fruit – tasty tarte tatin notes. Finish: Sweet icing turns woody, with menthol, drying tannins and a pleasant lingering sweetness with herbal touches. Very much a Rare Malts release – high strength, needing water, but showing off what the distillery’s all about. Foolishly, despite knowing that I liked Ord, I haven’t snapped up the old 12 Year Old while I could for a much more reasonable price, but I’m tempted to splash out a bit and stock up my cupboard. Highland Single Malt Scotch Whisky, 59.8%. Francis Keiffer liked this on Facebook. Michael Terry liked this on Facebook.